The 150th Emancipation Celebration will convene on Tuesday, January 1, 2013 at the St. John Baptist Church, “The Mighty Fortress” located 522-528 Hartridge St. It is said that organizations, families and foundations move forward on the feet of their children. The Emancipation Association of Savannah and vicinity is moving forward on the feet of its youth and young adults such as the young people of Central Missionary Baptist Church of Hitch Village where Rev. L. J. Stell is Pastor. During the 2012 Emancipation celebration, the Central Baptist Church had more youth in attendance than any other church. 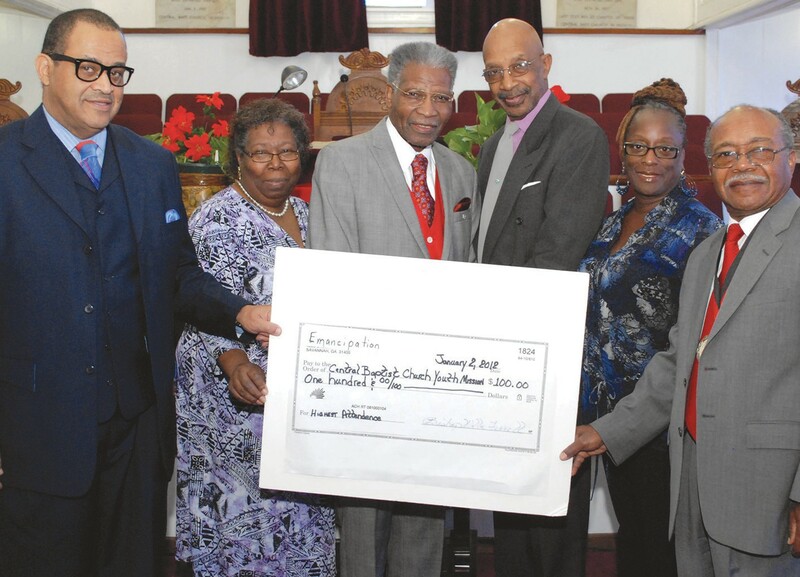 The picture above shows the Emancipation Association presenting a check to the Youth Department of the Central Missionary Baptist Church for its efforts. Your church can be the next church to receive a cash award for having the largest number of youth at this year’s Emancipation celebration. This is an effort to get a many of our young people involved in the Emancipation proclamation Celebration. Our young people need to know their history so that they might be proud of the achievements of their ancestry.